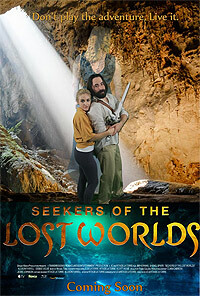 Seekers of the Lost Worlds (2017) - Sci-fi-central.com. USA  2017   Directed by: J.C. De La Torre, Rita De La Torre.  Starring: Jim Horning, Chandy Krapes, Scott Viguie, Debbie Viguie, Dean Chandler Bowden, Shanel Sparr, Allison Farrell, Traci Kohl.  Music by: Michael Tobin. After receiving a mysterious tablet from an anonymous source, two unlikely adventurers are sent on a quest for the lost continent of Atlantis. It is not my intent to give away the plot (there actually is a plot) other than it involves a treasure map. This movie is clearly a low budget production, but some low budget movies are quite well done. This isn't one of these movies. Filming this mostly in black and white fails to lend a sense of artistic quality to this. Most of the "acting" is unconvincing and a few of the performers have little ability to convey an emotion appropriate to the dialog. Foolishly, I kept watching, hoping for it to get better. Review by nebula-37029 from the Internet Movie Database.